From a lively arrangement of Hanukkah songs to reflective renditions of Christmas at Emory carols, December means the return of cherished campus traditions and the debut of new concerts filled with holiday cheer. From a lively arrangement of Hanukkah songs to reflective renditions of Christmas carols, the month of December at Emory means the return of cherished family-friendly performances as well as the introduction of new concerts that will fill you and your loved ones with holiday spirit. Since its establishment in 1935, "A Festival of Nine Lessons and Carols" has been one of Emory’s most beloved holiday traditions. 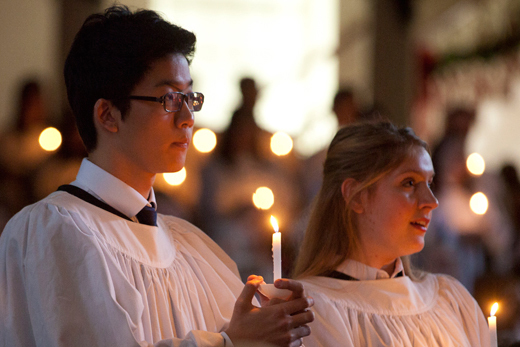 The sacred candlelit service features members of the Emory University Chorus and Concert Choir singing heartwarming renditions of classic Christmas songs, as well as several readings from the Old and New Testament by special guests from the Emory community. For the 2015 holiday season, "A Festival of Nine Lessons and Carols" takes place on Friday, Dec. 4, at 8 p.m. and Saturday, Dec. 5, at 4 p.m. and 8 p.m. in Glenn Auditorium. Tickets: $20; $15 discount categories, including faculty and staff; $5 Emory students. The Emory Wind Ensemble, under the leadership of new conductor Paul Bhasin, celebrates the season with a free concert on Sunday, Dec. 6, at 4 p.m. in the Schwartz Center for Performing Arts. A local favorite, "Christmas with the Atlanta Master Chorale" returns to the Schwartz Center on Saturday, Dec. 12, at 8 p.m. and Sunday, Dec. 13, at 4 p.m. This year’s holiday concert features a combination of new and traditional Christmas tunes that are sure to put audience members in a festive mood. Tickets: $30; $25 discount categories; $10 all students. The family-friendly Christmas event "Santa’s Favorite Chamber Music" caps off the holiday performances at Emory on Sunday, Dec. 13, at 4 p.m. in the Michael C. Carlos Museum. Old Saint Nick himself will appear to the audience to introduce some of his favorite classical works as well as give early Christmas treats to good listeners. Part of the Emory Chamber Music Society of Atlanta’s Family Series, this concert is free and open to the public. For tickets and details call 404-727-5050 or visit arts.emory.edu. The annual holiday performance of the Oxford Chorale will be Thursday, Dec. 3, and Friday, Dec. 4, at 8 p.m. in the Oxford College Chapel. The concert features the Oxford Chorale, Oxford Madrigal Singers, and Oxford Chamber Ensemble. The program includes traditional carols and seasonal pieces such as excerpts from Handel’s Messiah and Judas Maccabaeus as well as the Fantasia on Greensleeves by Ralph Vaughan Williams. On Saturday, Dec. 5, at 4 p.m. in the city of Oxford’s Old Church, Wesley Street at Fletcher Street, will be the 23rd annual Southern Folk Advent, combining folk, gospel and bluegrass music and presented by the Meridian Chorale, the Sonny Houston Band, and Steven Darsey, musical director and composer. Reflections will be given by E. Brooks Holifield, Charles Howard Candler Professor of American Church History Emeritus at Emory University. Oxford's Pierce Institute for Leadership and Community Engagement is a sponsor of the event. Student groups will also bring the sound of music to Oxford. On Dec. 8, the Voices of Praise Gospel Choir will give their annual Christmas concert. The following evening, Dec. 9, a capella group Oxapella will present their annual end-of-year performance, just in time for the start of final examinations on Dec. 10. As the year winds down, several exhibits on the Emory campus are set to close. Don't miss your last chance to view these compelling displays. "Bobby Jones: The Game of Life," about the legendary golfer who attended Emory School of Law, closes Nov. 30 in the Schatten Gallery of Robert W. Woodruff Library. "It's in the Cards: An Interactive Art Exhibit," based on creative modifications of old library catalog cards, closes Dec. 31 on level 2 of Woodruff Library. "Indigenous Beauty: Masterworks of American Indian Art from the Diker Collection" closes Jan. 3, 2016, in the Michael C. Carlos Museum. "'The Waters and the Wild: Alen MacWeeney and Photographs of Ireland" also closes Jan. 3 at the Carlos Museum.